Few months back, GEO channel aired different kinds of ads of success stories in education. We had very heated discussions with our friends on Facebook about those one-sided educational promos, in which only worldly education was being glorified: the materialistic approach that primarily helps people gain jobs, dubbed by GEO as ‘success’. Initially, nothing was too startling or alarming about it, but with a very smooth transition, the message has been stepped up to a whole new level. Now they have come up with a very bold and provocative message: Parhnay Likhnay k siwa Pakistan ka Matlab kaya? (What can be the meaning of Pakistan, Except education?). 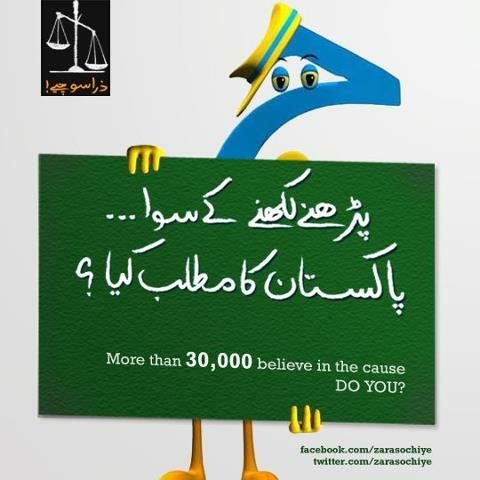 According to a survey conducted by the Gallop Pakistan this message is known to at least 44% of Pakistanis. 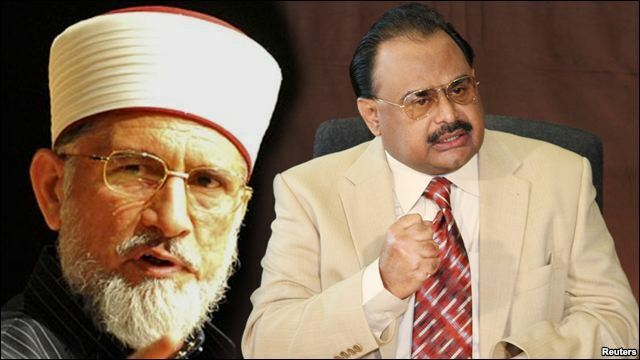 A tug of War between Pakistan Mainstream Media and Alternative Media is heating up by the day because of Ideological differences between these two. The alternative media criticizes mainstream media for its corrupt Anchors/Analysts, its vulgarity in different programs and its tilt towards India and Indian culture. conversely social media is criticized by the mainstream media and they accuse it of being made of not professional journalists or reporters; that social media is promoting religious extremism; that social media is narrow minded and that it promotes hatred for India/UK/US/Israel, Hindu/Jews/Christians. In a recent post titled “How much do you hate Pakistan’s media?” in “The Express Tribune Blog”, alternative media especially Facebook pages were targeted. The closing line of this post was “But what else could we expect? The media as an institution is after all, a mirror of the society it is operating in”. This is perfectly true and that’s what Alternative Media and the viewers are crying about. That is also the answer for “why we hate Pakistani Media?” Mainstream Media should be the mirror of society it is operating in but our media became the mirror of India and Turkey. It’s projecting their images, their plays, their stories, their views, their social values into our society. This reaction can also be found in the comments on this post. 75-80% agreed to the contents of alternative media. Question is not “How much we hate Pakistan’s media” the question is “Why we hate Pakistani Media”. There is always a bigger picture, bigger players and bigger interests. Let’s look at our scenario in the region. The Afghan US war is the most pressing global issue in the region and Pakistan is the key player that comes after Afghanistan in bringing stability into the land. US forces will be leaving Afghanistan in 2014. NATO and US presence depends on the Pakistan’s support alone. US could leave today but it yet needs a face saving excuse to exit along with other regional interests none of which could be achieved so far and it partly blames Pakistan for it. Elections in Pakistan are just months away. Despite all of its funding in shape of the Kerry Lugar Bill, the USAID etc. to make the Zardari Government successful, the inept corrupt government failed public support in the country and as a consequence failing the US cause. As it happens, PPP however much incapable, is the only force in Pakistan that can harbor US interests completely. Whereas smooth democratic transition in form of PTI or the coalition of PMLN with other Parties like JI is more likely to be underway, any one of which may force US troops to retreat even before 2014 or may not cooperate with the US backed Karzai regime. So what is the situation of Pakistan that suits US and NATO presence most. PPP being elected once again or given extension for an unlimited period of time. An Interim Government that suits its goals. Pak Army occupied internally acting as US proxy fighting its enemies in the region. A new democratic government that watches US interests after it leaves. In order to hide their crimes and to distort historical facts, Indian historians and political leaders have chosen to paint Quaid-e-Azam as the ‘villain of the piece’. The Indians propagate the theme that ‘Muhammad Ali Jinnah was a communalist responsible for the bloody break up of Pakistan. He founded a theocratic and non-secular State’. The BJP and other Hindu hardliners even now accuse him of leading a communal agitation to achieve the goal of Pakistan. This is travesty of history and negation of facts that prove beyond doubt that Partition was a legitimate and democratic outcome of the collective choice made by all Muslims and Hindus of the subcontinent. They conveniently and deliberately close their eyes to the hard fact that politics, not religion led to creation of Pakistan. Acceptance of Cabinet Mission Plan by Jinnah in 1946 demonstrated his earnestness for amicably resolving the communal problem. It was Nehru and his Congress colleagues who wasted that opportunity and dug the last nail in the coffin of united India. Nehru’s and other Indian leaders’ acts of commission and omission are far too many and have already been narrated by historians. 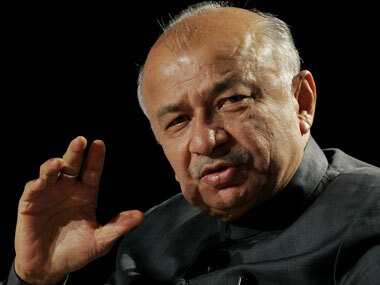 In a ground-breaking confession, India’s home minister Sushil Kumar Shinde has exposed the nexus between BJP and the RSS for breeding ‘Hindu terrorism’, a charge which has raged a storm from hard line Hindus on Indian mainstream and social media. He alleged that RSS was behind Samjhauta, Mecca Masjid and Malegaon blasts. “This is saffron terrorism that I have talked about. It is the same thing and nothing new. It has come in the media several times,” the home minister said. The Home Minister of India, P. Chidambaram urged Indians to beware of “Saffron terror” on August 25, 2010 at a meeting of state police chiefs in New Delhi, first time the word was officially used. Charging Congress with having a “destructive mindset which was reflected in the home minister’s statement”, BJP said it was “very objectionable”. “It is not only unacceptable but dangerous also,” party spokesman Mukhtar Abbas Naqvi said. 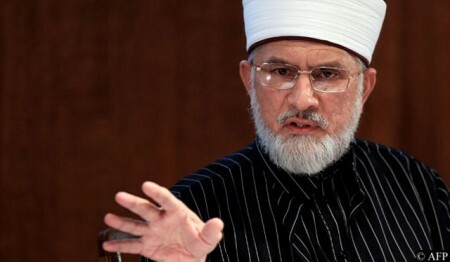 The “million march” that Allama Tahir-ul-Qadri (TUQ) had promised to launch on January 14, taking the capital by storm to rid Pakistan of its “inept” and “corrupt leadership” has occurred. The “million march”, may or may not comprise a million souls; depending on the view point of the observer. Pro-government as well as those opposition politicians feeling threatened by the ‘million march” are bent upon being myopic and perceive and propagate much fewer numbers. Neutral observers like this scribe and pro-change elements witness a sea of humanity, which may be close to a hundred thousand but more participants are still trickling in despite inclement weather, the numerous hurdles in reaching the venue like barring vehicles, innumerable security checkpoints and other harassment. 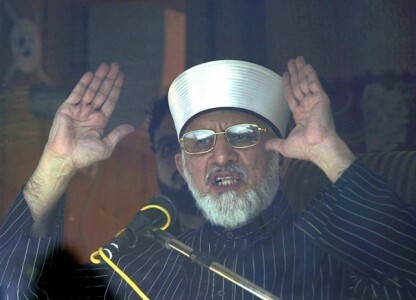 What is the TUQ phenomenon? Who is funding it? and what is the main objective of the “million march”? These are some of the questions, which have plagued analysts, potential supporters as well as detractors of TUQ. 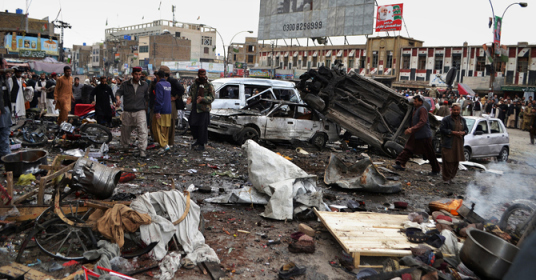 The recent episodes of terrorism in Quetta on January 10th, 2013 was one of the deadliest days for Pakistan as 120 innocent died and more than 200 injured. 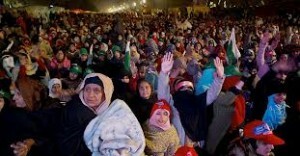 PKKH condemns the brutal killings of Shia Hazara in Quetta and stands by the victims in times of distress. PKKH understands the suffering of Hazara brothers and sisters and request the authorities that the perpetrators should be brought to justice and the alleged sectarian violence perpetrated across the country be dealt with. The daily ruthless killings of the innocents from Karachi to Quetta, and from Swat to Lahore, shows the incompetence and lack of ability on part of the government to counter and control this threat of violence and extremism. The government in her five year tenure couldn’t even guarantee the right to life of the citizen or safeguard the property and life of innocents. 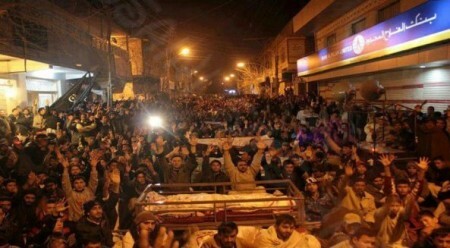 It is not wrong to say that Pakistan has been the most eventful theater of all sorts of political dynamics for several years; home to 4 Long-Marches and more in the making; where huge political rallies, both by the government and against it, are almost weekly events; where the world saw the largest and the most numerous anti-blasphemy protests. Where members of the parliament are often seen changing loyalties and where re-grouping is the vogue of the day. It seems, to the common observer, as if all those who hold the offices of the highest trust of their people, are the most un-trustworthy, befuddled in the bedlam of vested interests. For the common man there is no trust, no belief, skepticism fills the air and the air of collective conscience is becoming so heavy that the nation has come on the brink of nauseating.